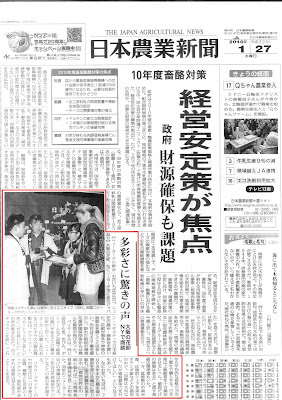 Our Japanese flower promotion event in New York have closed successfully and The largest daily agriculture newspaper in Japan reported our event in New York so called 'Naniwa Flower Expo (NaniwaFEX) in New York'. We displayed 237 varieties of Japanese flowers at this event, it was quite huge number of varieties! The date of event was so bad wether condition, ultra heavy wind & heavy rain shower but over 100 buyers/floral designers from over 60 companies visited to our event. It was very nice event for us and also for our customer in New York to introduce 'Unknown' beautiful flowers from Japan. For more details, please visit our official website for this event, please click following link!